At 9am today, police announced an unfortunate event at a high school in Glendale, a suburb in Phoenix, where 2 had been shot, as published in Yahoo News. At that time, they didn’t know if the victims were students nor the conditions of them. Of course, the school was locked down and streets were closed to traffic around the campus. A police officer tries to give instructions to parents waiting to reunite with their children. Later around 10am, all the parents started to arrive to the scene worried about their kids, as they were not able to leave the campus until police ensured the safety of the school. In the meantime, the dozens of parents were directed to locations near the area to wait for a word on their kids. 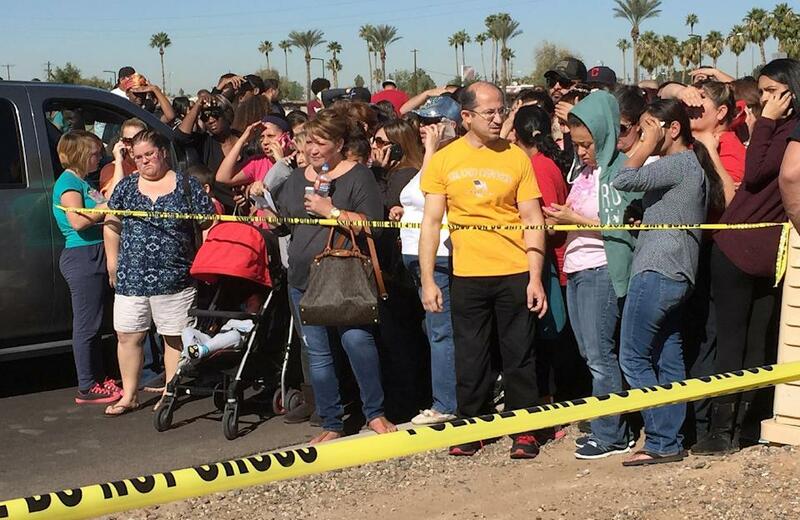 Parents and others wait near a high school in Glendale, Ariz., to be reunited with students. An hour later, police finally confirmed the death of two female students of the Independence High School. Glendale Officer said both victims were 15 year old girls and were shot once. She also told reporters that a weapon was found near the bodies. Authorities don’t know the motives of the shooting. Parents were bused to the campus to meet their children and then taken off the same way, while the students would ride their normal buses home.